The Ellen MacArthur Foundation recently reported that by 2050 there will be more plastic in the oceans than fish. As an island nation, we think Ireland should be leading the charge to stop this. We want 2018 to be the year Ireland stops drowning in plastic, and there’s lots that can be done to reduce plastic use and waste, but it’s going to take people power. Our greatest strength at Friends of the Earth is our ability to mobilize Irish people and pressure elected officials to act in the public interest. With help from people like you, we secured Ireland’s first climate law in 2015; supported a national fracking ban in 2017; and just this week the Minister confirmed to us that a scheme to support rooftop solar will happen at least as fast as one for bigger commercial developments. Now, with your support, we want to put our weight behind a campaign to dramatically reduce single-use plastic waste in Ireland. The ideas are already there: a ban or levy on plastic coffee cups, a deposit and return scheme for plastic bottles, and pressing supermarkets to reduce the plastic packaging they force on us. With your support we can help turn those ideas into action. As a special gift for being one of our first Sick Of Plastic supporters, we’ll send you one of our new, limited-edition Friends of the Earth Keep Cups if you pledge €12 a month or more. That’s the cost of just one cup of coffee a week. 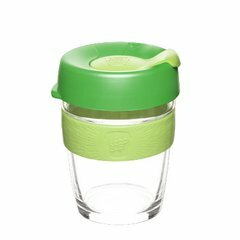 With over 2 million disposable coffee cups a day being wasted in Ireland right now, we’re sure you’ll make good use of this stylish cup for years to come. Get your limited edition Friends of the Earth Keep Cup now. If you’re not in position to make a monthly gift you can still make a one-off donation to help kick-start our Sick Of Plastic campaign. We campaign on a shoestring so whatever you can give will make a real difference. All the staff at Friends of the Earth wish you a festive holiday season. Let’s make 2018 the year we turn the tide on plastic waste.